Managing your family’s affairs on your own can be challenging every day—so you may have postponed planning for the future. Yet, you have others who rely on you. You can take simple steps to ensure their financial future—as well as your own. Since you're a single parent, it may be even more important that you take action soon. 1. Define and prioritize what is important to you by using the Goals Worksheet. 2. Calculate how much of your income you can put aside to reach those goals. Use the Financial Analyzer. 3. Talk to a financial professional in your area. • To estimate your net worth and understand your cash flow, use the Financial Analyzer. • To start on the path to being a savvy investor, learn investment basics. 1. Determine which goals you want to fund by using the Goals Worksheet. 2. Review your resources. Get started with the Major Purchase Worksheet. 3. Examine your situation to see if you are still on track. 4. Talk to a financial professional. With the rising cost of tuition, funding an education can be a challenge. That's why it is vital to understand your options and develop a practical strategy. According to the Consumer Price Index, education costs rose 5.1% in 2000 and 6.9% in 2004—which is even higher than the rate of inflation (according to the Bureau of Labor Statistics Data, U.S. Department of Labor). The right type of life insurance and the right amount of coverage can help ensure that your loved ones will always be able to fulfill their dreams and goals. Find out more about life insurance or get a quote to estimate how much it might cost. How would you pay your monthly bills if you were seriously injured or ill for months or even longer? If you're like most people, you don't anticipate a circumstance that would prevent you from maintaining your current lifestyle. But, the reality is that a 35-year-old has a 41% chance of suffering at least one 90-day disability before the age of 65 (Society of Actuaries, 1995). Learn more. How long do you think your retirement will last? Most women still working today can look forward to a period of 15, 20 or even more years of retirement or semi-retirement. Will your current plans help you realize your retirement dreams later in life? Get help with your retirement planning. Getting married is an important and exciting personal commitment. For most people, a lot of planning goes into that one big day. After the vows, the champagne and the honeymoon, however, there are still steps to take to ensure that your personal commitment is reflected in your financial affairs. Make name changes official: If you are changing your surname, order a new Social Security card and driver’s license with the new name. Notify your employer, creditors and financial institutions of the change as well. For help with Social Security go to socialsecurity.gov/gethelp1.htm. Adjust income tax withholding: If you plan to file a joint tax return, change your filing status to "married" by filling out a new W-4 form (contact your human services or payroll department for more information). Depending on your income, changing your filing status may increase your take-home pay. Coordinate health insurance: You and your spouse are probably each covered by your own employer’s health insurance. Check with your employers to find out if it’s less expensive to cover you both under one of your plans. Revise wills and beneficiary designations: To ensure that the right person inherits your assets, update your will and the beneficiary designation on your retirement accounts, insurance policies and other important financial documents. The United States Social Security Program, started in 1935, is meant to provide supplemental support for retired or disabled persons in the United States. Unless you were employed by an agency that opted out of the Social Security system, every paycheck you've earned throughout your life has had Social Security tax taken out of it. This money isn't reserved for you when you retire. It's put into a large fund from which current Social Security benefits are paid. But your tax isn't being taken in vain. You receive Social Security credit for your tax. You need to have been employed for at least 40 quarters under Social Security to be eligible for Social Security benefits when you retire. All workers who are over the age of 25, who are not yet receiving Social Security benefits, receive yearly statements from the Social Security Administration. These statements contain your earnings over the years as well as estimates for your Social Security retirement, disability and survivor's benefits. Check these statements carefully to make sure you are getting credit for all of your earnings. Errors could affect your benefits. 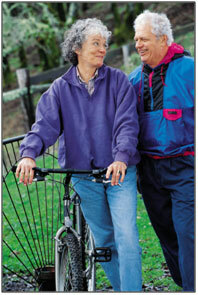 The soonest you can receive Social Security retirement benefits is at age 62. But if you delay receiving benefits until a few years later, your benefit amount will be greater. This decision should be based on your financial position - do you need the money or can you wait until your benefits reach their full potential? No matter when you choose to start collecting benefits, you must sign up three months in advance of when you actually want to receive your first check. One in six Americans now collects Social Security benefits. That's more than 45 million people. For now, there is more money going into the Social Security fund than is being paid out. But as the baby boomer population gets older, there will be many more people eligible for Social Security benefits. The money going into the fund will not be enough to cover all the benefits being paid out.